In early 2009, Rand Soellner, AIA/NCARB and energy efficiency engineers with Beaudin Ganze Consulting Engineers (BGCE) explored the usage of the newer, cutting-edge high-output LED lamps (commonly referred to as “light bulbs”) in lieu of either incandescent bulbs or the seemingly efficient & “green” compact fluorescent bulbs. As green architects and green engineers, we wanted low-energy consumption devices that are renewable (sustainable) and gentle on the environment. Rand Soellner was looking for a truly more energy efficient home lighting source in his roles as a mountain home architect and themed resort architect, project types in which he designs worldwide. Beaudin Ganze Consulting Engineers is Soellner’s consulting engineer in Rand Soellner’s Mountain Resort Architects Design Team, an affiliated group of architects and engineers formed by Soellner to handle larger mountain themed resort projects. Rand spoke with Denis Beaudin, P.E. and Patrick Burns, P.E., of BGCE, about this issue. by Rand Soellner Architect & Beaudin Ganze Consulting Engineers, Inc.
Rand Soellner and BGCE had discovered a new LED light bulb, the PAR38 13Watt, High Power LED Bulb Flood Light, 120 volts, with a 3,000K warm white color correction. According to the bulb’s marketing literature, this has 960 lumens, consuming about 13w, comparable to a 75w incandescent light bulb. Mr. Soellner questioned that when comparing wattage, this meant that the LED flood light was more than 5.7 times more energy conservative than a 75w incandescent bulb for the same amount of light output. BGCE confirmed that this was true. Rand was wondering if the LED would work in exterior locations as well as interior and BGCE agreed that it should. It appeared that this might represent a breakthrough for energy efficient home lighting. Rand asked if the surface of the LED might crack if some rain or other moisture contacted it and BGE said that the surface of an LED bulb is much cooler than a comparable incandescent, so much so that one could put their hand on the LED surface and it would not feel too hot. Rand Soellner obtained one of these new LED bulbs (see photo) and discovered that they are remarkably cooler than an incandescent, especially when just being turned on. After being on for several minutes, the temperature became somewhat uncomfortable to a human hand, but not the searing heat that comes off an incandescent bulb. 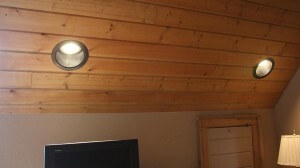 Even so, BGE and the LED manufacturers have mentioned that there are different ratings for various LED lamps and care should be taken as to the exposure of each lamp location so that truly wet locations have a stricter manufacturing seal than those lamps that could safely be used in an exterior porch ceiling pointing down. Fortunately, these different manufacturing requirements are available and have been incorporated into Rand Soellner Architect’s specifications. Your house plans need to incorporate these guidelines for energy efficient home lighting. Longevity: this new bulb is rated at by the manufacturer at 50,000 hours, which is equivalent to 17.1 years of usage! This assumes that the lights would be on for 8 hours a day, every day of the year. During all that time, these lights would be using about 570% LESS energy than normal incandescent lights. This translates into saved dollars in your pocket, less power plant utility company electricity generated, and less heat generated in your home where these LED lights are being used, meaning that’s less air-conditioning cooling to offset the heat created by the lighting. If you don’t think the heat created by lighting could possibly be much, consider that the Mall of America in Minnesota, near the Canadian border, possibly the largest shopping mall in the World, has NO heating plant for their air handling. All the heat they need for millions of square feet of space is provided by the people inside the space AND the lighting. That’s right; the lights themselves are the major contributor to heating those vast spaces. So, using lighting that generates less heat is a very good thing, when you are considering methods to reduce energy consumption for air-conditioning cooling. Homes are responsible for more energy consumption than all of the commercial facilities combined. That is why finding more conservative devices, such as energy efficient home lighting is important. We feel we have found something here that might help a lot. And Rand Soellner Architect strives to reduce maintenance in their projects. Having light bulbs that only need to be replaced about once every 17 years or so, particularly in hard-to reach, higher locations, is a significant benefit. Patrick Burns of BGCE stated that while the manufacturers indicate this extremely long bulb life, he tends to believe them, however, only time will tell as to actual longevity in the field. BGCE had heard that the heat sink connection is critical to the life of the LED and that failure of manufacturers to achieve a proper heat sink could lead to prematurely short lifespan. It is important to obtain the LEDs from reputable manufacturers that will warranty their goods. Compact fluorescent lighting and the environment: Rand, who is an eco-friendly home architect, remembered hearing something about this fixture type that wasn’t very eco-friendly. BGCE said that was true; that compact fluorescent lamps have mercury in them and that mercury is very bad for the environment. While it is a legal requirement that disposable items containing mercury be handled by a hazardous waste company, Rand wondered if that was really what everyone who needs to dispose of a used compact fluorescent lamp will actually do: “Hello Hazmat? I need to have you come over here and remove my used lamps and pay you a bunch of money for taking them away and for properly burying them in a sanitary, chemically-resistive lined landfill.” Hmmmm. So, both BGCE and Rand Soellner concluded that compact fluorescents really aren’t a very good choice for the environment, even though they do save energy. You have to look at the whole picture. 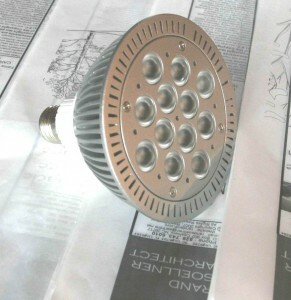 Rand asked BGCE if the new High Output LEDs had any components or ingredients that were environmentally destructive. Mr. Burns said that he knew of no such characteristics. Back to the LED high-output light bulbs. “Temperature K (Kelvin):” this has to do with the perceived warmth or yellowness of a light versus coldness or blue-shift. One of the reasons many people enjoy incandescent lights is that they have a very homey, yellowy shift. There has been much discussion over the decades that fluorescent lights have a truer, whiter light, more in line with what pure sunshine is. Well, so far, it has been perceived, in my opinion, that fluorescent light still is not as warm as incandescent light. Okay, so how about LED light? BGCE had concerns that even the “warm white” LEDs are not going to be as warm as incandescent lights. Since this initial writing, both BGCE and Rand Soellner Architect obtained a sample LED bulb and have agreed that the color, at least initially, and so far in our respective offices, appears similar to incandescent in terms of color. So, this energy efficient home lighting seems to be aesthetically satisfying as well functionally superior. BGCE had also heard anecdotal concerns over a possible long-term color shift of the LED, although both BGCE’s and Rand Soellner’s in-office testing to date indicated a pleasant warm color, not significantly different from incandescent bulbs, so far. (Update: a year later: no color shift noticed in Soellner’s office with the LED). Time will tell as to whether or not this remains true. 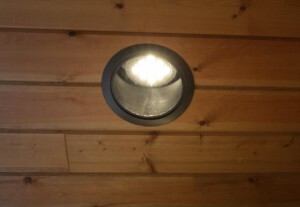 Usage for uplighting in a bounce light situation will likely produce good results, as we use a Minwax Golden Oak stain on spruce and this will likely shift the light bounced off the ceiling to be warmer. Direct down light at interiors with the LED, even with the warm white lamp was a concern of BGCE’s, however, this concern was one of color, and after testing, we have found the color to be quite pleasant so far. We will be using bounce light up toward ceilings to create a softer, warmer glow of general diffuse illumination inside and outside, as well as down lighting. This appears to be a true breakthough for energy efficient home lighting. LED (left) and 75w incandescent (right) in Rand Soellner Architect’s office. Light from both appears similar. We detected only perhaps a very slight whiter light from the LED (which is a “warm” color corrected lamp). Can you see any difference? Patrick Burns said that due to the new simplified 120v screw-in base of the new LED lamps, if there is any problem with a particular location, an ordinary incandescent light bulb can take its place. And that comes around to the fact that this new LED is self-contained and does work in an ordinary light fixture for a standard incandescent lamp. Cost: the High Output LED bulbs are about $110 each. That’s pretty high, compared to perhaps a buck for single ordinary 75w incandescent lamp. However, when you consider the relative cost of an entire house under construction, of perhaps 4,500 to 6,000 heated square feet, Rand Soellner estimated the additional cost of the LED lamps are perhaps $4,000 to $8,000 more than lamping everything with just incandescent light bulbs. If $100 of each month’s electrical bill was attributable to incandescent lighting (which is not a scientific analysis and this would have to be verified for a particular power company in a particular location), over 17.1 years, this totals perhaps $20,520 (also, this is in guesstimated 2009 dollars, not what is likely to become higher costs through 2026. Dividing $20,520 by 5.76 (the lower wattage power consumption of the LED energy efficient home lighting = $3,562.50. Which yields $16,957.50 more power consumption that the incandescent lamps may have used over this time period (if the assumptions are correct). My personal experience is that a normal incandescent lamp lasts about 3 months +/- in my house, for lights that are used daily during the evening. At the cost of about $1 each, = $4 per year per lamp location x 100 lamps (the basis of the initial capital cost of the LEDs in lieu of incandescent lamps costing perhaps up to $8,000 more) = $400 per year x 17.1 years = $6,840 added to the $16,957.50 greater energy consumption = $23,797.50 greater cost of using incandescent light bulbs over the manufacturer’s projected life of the LED lamp. Rand asked BGE if he believed the LED lamp accelerated aging testing by LED manufacturers. This is all part of Home Value Engineering. Patrick said that he did believe the data, so far. So, if we subtract the initial cost (or capital cost) of installing LEDs in lieu of incandescent bulbs ($8,000+/-) from the increased cost of replacing and power consumption of the incandescent lamps ($23,797.50) = $15,797.50 Life Cycle Cost cheaper to use the LEDs rather than incandescent lamps. In other words, our rough Value Engineering analysis here seems to indicate that not only will you have immediately lower power bills over the life span of the LEDs, you will also pay less total, even when you factor in the cost of the lamps themselves. This analysis also does Not take into account what will likely be a noticeable advantage in terms of less heat load on air-conditioning electrical power consumption due to using the more energy efficient home lighting LED lamps that burn approximately 1/6 of the power that the incandescent lamps do. What would this amount to over 17.1 years? Shall we guess at perhaps $50 per each cooling month? Not very scientific, but it is bound to be something, maybe a higher number, but let’s be conservative. Let’s say we have 5 cooling months a year in a normal temperate climate, which would be higher in southern climates, and perhaps less in more northern areas. That adds $250 a year advantage to the LED solution x 17.1 = $4,275. This means that the $15,797.50 + $4,275 = $20,072.50 over the 17.1 years, in 2009 static dollars. It appears that we then have a significant Life Cycle Cost Advantage to using the LEDs, at least in terms of this unscientific analysis using assumptions that may or may not be flawed. This analysis does Not take into account higher interest payments for debt service on the additional loan amount necessary to pay for the LEDs in the initial construction. Let’s take a quick look at that. Rates right now for a non-conforming jumbo loan appear to be at around 8% for a 30-year fixed loan. 8% x $8,000 = $640 simple interest more debt service per year x 17.1 = $10,944. $20,072.50 – $10, 944 = $9,128.50 advantage for the LEDs. Which means, the LEDs still win in the Home Value Engineering Analysis, if the basic assumptions are correct. The above value analysis did not have BGCE’s engineering input. Mr. Burns’ opinion is that the heat contribution of lighting in homes is not a large a factor as in commercial construction. Rand Soellner’s experience is that it can be. This all depends on how well sealed your home is, insulation values and other factors. While neither Beaudin Ganze Consulting Engineers nor Rand Soellner Architect endorse any particular manufacturer for any particular product, so as to maintain our objectivity in the best interests of our clients, we concur that this new breed of energy efficient home lighting LED High Output light bulb (lamp) does appear to have substantial advantages over incandescent and fluorescent lamps in some situations, yielding the same level illumination as an equivalent 65w or 75w incandescent lamp, for about 1/6 of the power consumption, with no environmental pollution issues to our knowledge, and for a Life Cycle Cost that is less than using conventional incandescent light bulbs. Also, landfills will not be receiving as much trash from burned-out incandescent lamps (approximately 6,840 over 17.1 years) and power utility companies will not have to produce as much energy to illuminate this case study house over the 17.1 years and if this was the case with millions of homes, this has got to be an improvement in the polluting effects on energy generation on the environment, whether it be coal, nuclear, or other normal fuels. Final verdict: LEDs appear to be a good thing for homeowners and the environment and are in fact energy efficient home lighting. In addition to mountain resort architecture, Rand Soellner’s firm is known as green home architects. tags: energy efficient lighting, green architecture, cashiers, highlands, denver, lake tahoe, asheville, atlanta, hendersonville, macon, franklin, sylva, waynesville, mobile, fresno, las vegas, south bend, nashville. 1. What is the most efficient light “bulb” in terms of power consumed for roughly the same lumen output and with little to no environmental pollution? a. LED (Light Emitting Diode lamps). b. Incandescent bulbs (which are typical in most homes). 3. What is the Worst thing about CFLs? a. While they do save on power consumption, they have historically contained mercury, which, if thrown into standard unlined landfills can result in toxic pollution of driking water acquifers. b. They just look strange. c. Their light, while supposedly warm color-corrected is still too white for many people. then click here: Indoor Air Quality in Homes to go to the next level 19. UPDATE: it’s been several years since the above article was published. LEDs have finally come down in cost sufficiently to be reasonable in cost for just about any homeowner. ALL of this architect’s new projects are being specified with 100% LED lights.